While we're thrilled to have recently released the 2014 analysis of the "Our Minnesota" Cascading Conversations Tour, this conversation for our generation is only still beginning, and we'd love you to be a part of it! 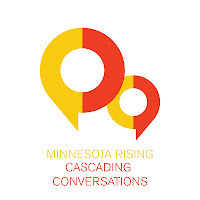 We invite you to participate in a cascading conversation and/or to to serve on our 2015 Advance Team and help to host 3 - 5 other young Minnesotans in hour-long conversations this summer. Mark your calendars for the 2015 Advance Team Orientation and RSVP to the eddress below to let us know to save you a seat. Hope to see you there!